Think personalised gift and a blanket may not have been the first thing you thought of but it’s one of the growing number of of products available from Spreadshirt which can be customised. And when you think about it, it’s actually a great idea, allowing the intended recipient to wrap up warm inside the words you’ve chosen to put on their blanket. A blanket itself is warming but when you’ve personalised it with the name of the recipient, it becomes heart-warming too. As with all the products at Spreadshirt, you start with your base product and then can add text or graphics (choose a design or icon and pay extra or upload a picture of your own). 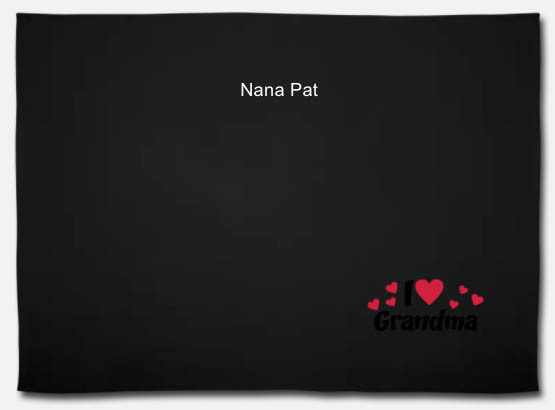 So you could tell your gran how much you love on her on her very own personalised blanket. Or how about a sweet message for someone getting over an operation? The blanket itself is soft and warm, smooth on one side and fleecy on the other.It measures up at 127cm by 152cm and is available in grey, red or black – blankets cost about £25 plus delivery. Click here for to choose and design a personalised blanket.